The Ultimate Support TS-110BL (Item#17357) is an air-powered speaker stand/light stand tripod with leveling leg that lifts and lowers speakers & lights with the use of an air-assist, air-lift shock. The TS-110BL has a leveling leg which is perfect for making your speaker or lights level even on unlevel surfaces. Leveling Leg - Included! Watch video to learn more. Have you ever run into a situation when you wished you could place a speaker where a set of stairs, risers, or a short ledge was in the way? 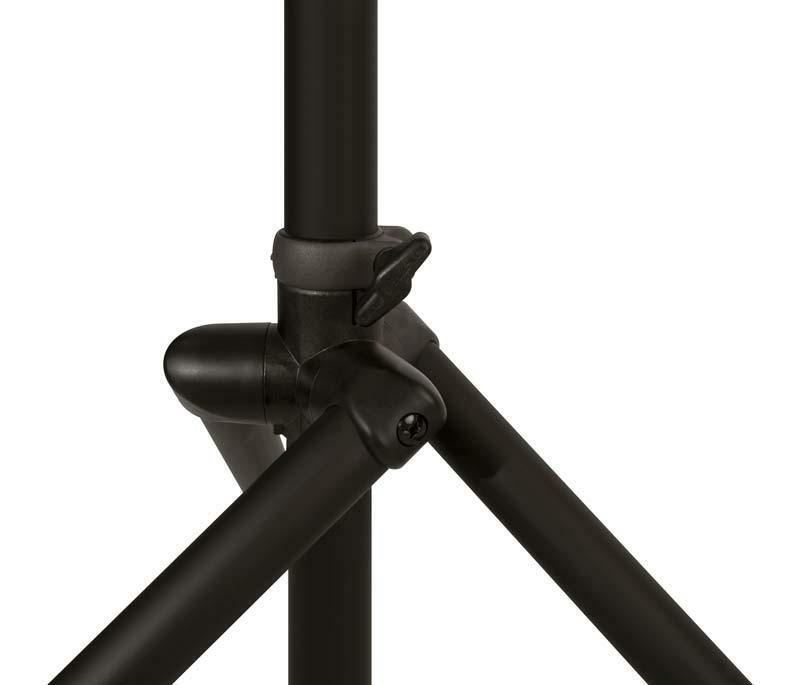 The TS-110BL includes one leveling leg that telescopes down an additional 13" beyond the length of the other two tripod legs - allowing you to place the TS-110BL on a set of stairs, risers, or hillside, etc. Watch video! The original TS-100B is plenty tall enough for most normal situations. 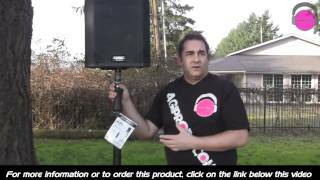 However, when you need to get your speaker, lighting tree, light truss, or whatever, up a little higher, the TS-110B is the perfect stand for you! 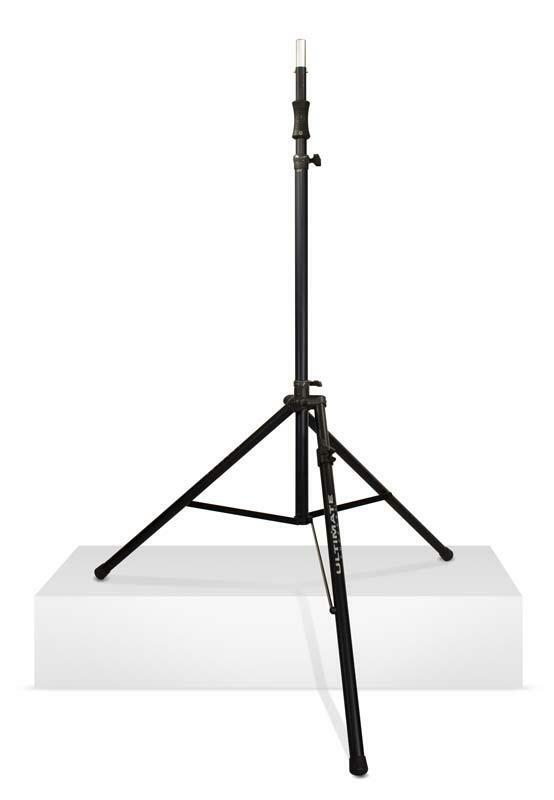 The TS-110B adds about 26 inches of additional height and has a maximum height of 9' 2"! 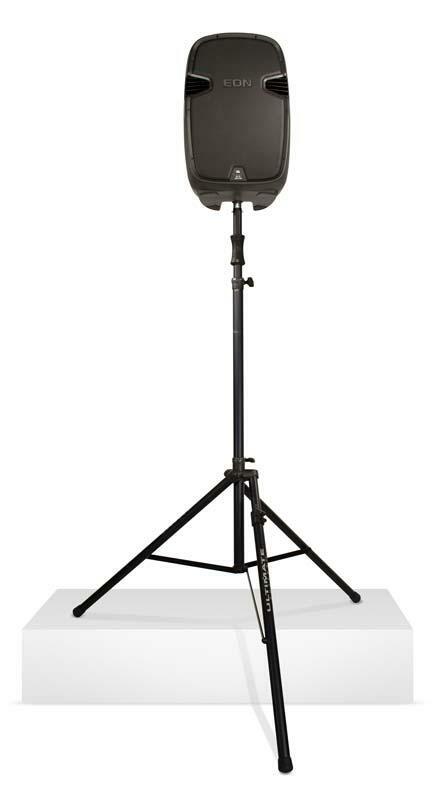 The TS-100?s offset tripod base design provides more support than typical "off-the-shelf" speaker stands. The design makes for very tight internal fittings, doing away with unnecessary sloppy leg problems, and includes a super strong die-cast metal collar that prevents over-tightening and breakage issues associated with all plastic designs. The entire stand (legs, mast, and telescoping tube) uses oversized, heavy-walled aluminum tubing for durability, functionality, and weight savings. The TS-100BL will not rust or corrode (thanks to its architectural anodized finish), is very smooth to operate, and is extraordinarily strong yet lightweight. From the foot caps on the bottom of the tripod legs all the way up to the speaker adapter at the top of the stand, the TS-100BL is serviceable by parts as needed over its very long lifespan. In the unlikely event that something does break on the TS-100BL, simply replace with an affordable part instead of throwing the entire stand away and buying a whole new one!